Eurogamer 2010 Hands On: Medal of Honor Multiplayer - This Is My Joystick! 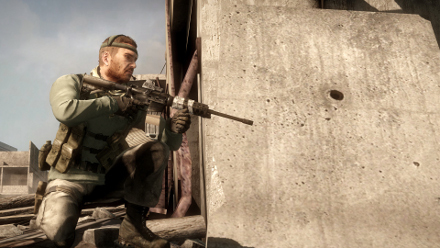 One of the longest queues at Eurogamer on Friday was for the Medal of Honor Multiplayer. Thankfully for me I had Neil and Ray to keep me company while I stood for an hour waiting patiently for my turn. After a very slow shuffle and having fought the growing need for a toilet break I finally took my seat, picked up the PS3 pad and prepared myself for the Taliban. A large amount of the press surrounding EA’s newest addition to the Medal of Honor franchise has been regarding the opposition you face throughout the game rather than the game itself, so it was nice to finally get past all the hype and find out how it actually played. It is worth noting that although you do see your opponents as Taliban soldiers (no longer known as Taliban in the game), they are not controllable. The first thing that you immediately notice about Medal of Honor is the visuals; there really is incredible detail on everything. The map played was a mountainous area with caves and buildings for cover either side of a sandy road which contains plenty of cover spots and good sniper positions to find and utilise. You can comfortably scout your opposition before taking a shot and some of the death animations are just classic war film. Be afraid, he's wearing a mask. The sound effects are also pretty impressive, the gunfire literally rattles around your head at times. Obviously the show floor is not the easiest place to judge a games atmosphere but you can certainly see the potential when sitting in your living room with the surround sound in full effect. I think at one point I actually ducked to avoid the bullets. 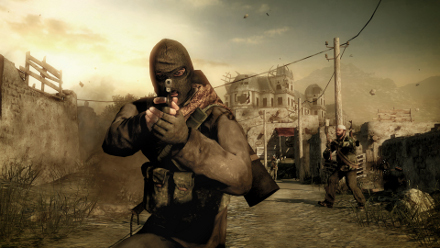 The multiplayer demo was set up as a standard team deathmatch with a points total to reach rather than a time limit and the game went on for around 10-15 minutes in total, although it felt much less. There are three classes to choose from in total which are Rifleman; your general all rounder, Special Ops; better for closer combat and Sniper; better for longer range attacks. These are both customisable and swappable at every respawn meaning you don’t end up totally frustrated after a couple of minutes when you realise you picked the wrong set up. The controls are set up as every FPS worth its salt now is with Fire R1, Scope L1, Grenades R2 and Explosives L2. The face buttons likewise follow a familiar trend of Square to reload, Triangle swap weapon, O crouch and X to jump. This makes the game instantly comfortable to play, although being an XBOX 360 man it did take me a while to readjust to the PS3 pad. I enjoyed the demo and as I mentioned earlier, it looks amazing but here’s the problem: Medal of Honor multiplayer really does not have anything to set it apart from other titles on the market. The obvious comparison is with a certain other war franchise that is also due its latest addition over the next few weeks and the pending release of Activision’s title is bound to draw even more comparisons when MoH is released next Friday. I was slightly disappointed not to at least be given an opportunity to see what the single player campaign has to offer as this is where the title could differentiate itself from the competition. It is hard to imagine that with Halo Reach only recently released and Black Ops looming on the horizon that too many will rush out and buy this based on its multiplayer modes but if the numbers are there, on this showing it will definitely offer plenty of enjoyment.